With the rapid grow of economy and technology every industry has to be constantly improving their tools and services offered in order to supply the high demand from their customers. Technology today offers top notch capabilities through the internet and software to make everything more efficient and cost effective; from paperless bank statements to wireless phone calls, industries are giving customers more options in order to expand their reach and provide service. Although all these improvements are good and are helping a lot of people get through, scam artists are also gaining up on the various tools to improve their New Car Transport Scams. With this growth, companies have been able to provide more security to guarantee a great service, card companies, banks and other intermediate channels such as online portals now provide tracking systems for all payments in order to ensure a transaction is legal and done properly. As more and more companies are online base, the Better Business Bureau (BBB) and Public Service also offer an online data base for you to check the credibility of the company you are dealing with. Different links help you read reviews as well so you can see what other customer’s experiences have been while using the company. Unfortunately, regardless of all the tools available to avoid scams, still many people are fooled and fall in their hands due to their shady and very sleek techniques. In the car transport business it is very common to use a broker in order to book a transportation service, as brokers facilitate the booking process. Drivers are constantly on the road and cannot be in constant communication to close deals with customers; therefore they also book their loads through brokers. Many people are skeptical when they hear they have a broker on the line and immediately hang up, not know drivers also use drivers to get to customers. Unfortunately brokers have been given a bad reputation due to all the horror stories and scams that have occurred throughout time, however with all the facilities you have today to review and check out a company watch out for red flags and immediately walk away if something does not sound right. First off, a deposit is not to be done nor a credit card should be kept on file for no reason until a driver is booked and confirmed; you should be provided drivers info and confirmed pickup and delivery dates. Most brokers work under commission, as you may know, commissions are provided only after order has been booked and completed, in this case, once the car has been delivered, why should you pay a deposit for a broker before your order has been booked? Now scam artists and shady companies will find many ways to lure you in and pay as much as they can beforehand to later leave you in the back burner. Stay away from these schemes! Some of the tactics used today is changing the name of the deposit or broker fee to more sophisticated terms in order to make it sound like its part of the transport service, such as consultation fee, paperwork and processing fee, and many other creative names. Agents will even provide an agreement for you to sign where they clear themselves in the event you would like to dispute the charge later on. You do not need to pay for a consultation fee nor for processing or paperwork, you are not hiring a data filing service nor consulting, you’re requesting a transportation service. This is a flag you should consider. Another thing that is customary for bad service is providing you a really low rate and at the last minute raising your price to get you moved. 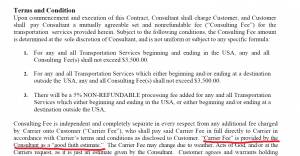 Some companies will even include in their contracts that rate is later determined by “good faith” of the driver with the sky as their limit for a final price. This is not good business practice, when you request a service and sign an agreement you must know how much you will pay and it must be stated in the contract. The reason you sign the contract is to confirm the agreement you are entering with another person or company that for the service rendered you will pay a determined amount. 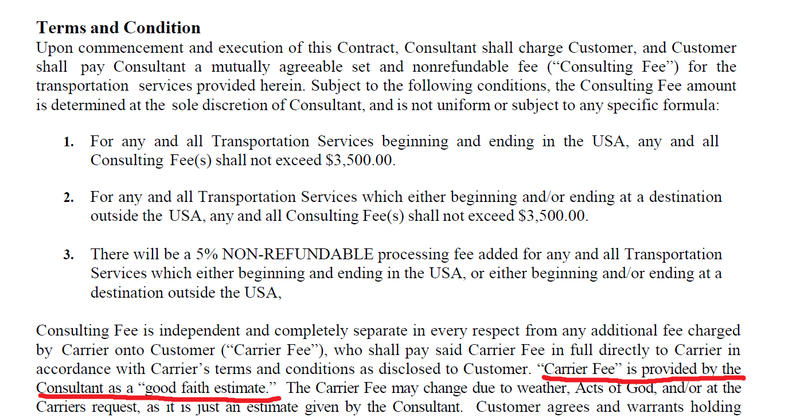 This agreement will both cover you to receive service and the company to get paid for the service offered. All contracts or order forms need to have terms and conditions or the companies policies included in the event of any scenario. If you receive a form with only minor details, DO NOT sign your name, you do not know what else they will add in later on and since it is signed already, you will be entitled to pay. No matter how tedious and long an agreement is, READ IT! You do not know what other hidden fees can be stated or what transactions you are authorizing. What most scammers will do is charge you upfront for whatever fee they state money is for, whether it’s a convenience fee, consultant fee, processing or whichever fancy name they put on it, then they will disappear, not answer calls, e-mails, nor reply to any request. Your shipping date will pass with no pickup and you will be stranded with no service and less money on your pocket. Now at this moment you’re desperate to find something else and decide to move on and book with another company, at the moment you cancel then all of a sudden your card is charged again for a cancellation fee you signed and agreed to pay already! If you dispute the charge, your signed agreement will rule out any possibility to get the money back. Another way you can avoid being part of these scams is reviewing the company you deal with, like mentioned before the BBB, public service and virtually any website now can provide you all the reviews posted for the company from previous customer’s experiences. Now you must learn to differentiate between bad reviews as some of the bad experiences are not due to bad broker assistance or scams but due to customer negligence. If a company has constant bad reviews, regardless of the reason, something is wrong with them, so don’t even consider doing business with them even of their price is the best. Nowadays there is no excuse for not checking a company out and checking for credentials. Internet has provided so many tools for people to use to avoid getting caught up in scams that if they do, it’s simply because they did not check or simply because they ignored the signs. For more details on more tips to avoid car transport scam click here!